Plastic is a truly amazing material, and its inherent versatility means it holds a huge range of benefits for a broad array of industries. One such industry is the educational sector, and at Excelsior we have several customers in this field who regularly enjoy the advantages from our rotomoulded plastic products. This week on the blog, we thought it was worth explaining them all in a bit more detail. You don’t have to be a teacher to know that children – especially younger children – can be a handful. They can take longer to grasp the value of things around them and the notion of treating them carefully; and that’s exactly why plastic excels in this area. The inherent durability of plastic protects it against the brief attention spans, short tempers and boundless energy of young children. In high traffic environments like nurseries or classrooms, there are any number of calamities that can befall an average product (for example, a set of safety steps for tall bookcases). Children can bump into them, drop them, kick them, spill things on them… and that’s just the start! This all means that the high durability of plastic products make them worth their weight in gold to teachers and childminders, especially if they’re not specifically ‘owned’ by anyone in particular. Of course, even with plastic’s superior durability, there will be times when breakages will occur, especially given the rough play that young children regularly subject their toys to. When that happens, replacements are inexpensive to come by. This is a particular benefit to schools and small nurseries, many of which often have to juggle their funding carefully. 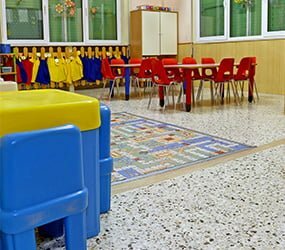 To touch once more upon the durability and long life of plastic, these characteristics – combined with its cost-effective nature – together mean that almost all plastic supplies for schools work out to become supremely economical. This is always welcome news! Now we come to one of the main reasons that many educational products are made from plastic – above all else, they’re safe for children to use. We’ve already mentioned part of why this is in a previous point when we talked about durability; alternative wooden toys, for example, can split and splinter, opening children up to the possibility of serious injury. Plastic, on the other hand, breaks relatively safely – and it has to be subjected to some major punishment before even that happens. Plastic is also a poor home for germs and bacteria, which is a key advantage for a material that – let’s be honest – children are constantly sticking in their mouths. On that note, adults tend to love plastic products for their ease of cleaning. Children can spill food, paint and glue on classroom objects, and all it takes is a quick splash of water and maybe a wipe down from the teacher until it’s ready to use again. Looking at all these points together, it’s not hard to see why plastic has long been used in classrooms and educational settings. We’ve not even gone into its use in equipment for school gymnasiums – we feel we covered that pretty comprehensively in our last blog about the uses of plastic in the leisure industry. Whether you work in education or another industry, at Excelsior we pride ourselves on using our rotmoulding techniques to create your ideal product. Just fill out our contact form or ring us on 0161 765 2010 to tell us about your idea, and we’ll help you make your plastic product a reality!